Frustrated that most press has been on the editor rather than the 115 clergywomen who contributed, here’s their stories. Let’s Hear It For the Boy? 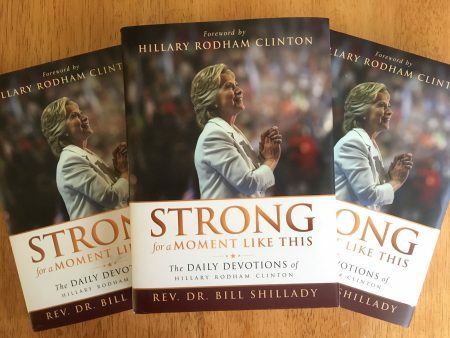 August 15th, 2017, was the release date for Strong for a Moment Like This: The Daily Devotionals of Hillary Rodham Clinton. Every day for a year, Secretary Clinton received a devotional written by a clergywoman or a member of her religious support team. The book is a compilation of some of those devotionals–here’s more info at Abingdon Press and here’s their Facebook page. On November 9, the day after the election, Shillady sent Clinton an email titled, “Sunday is Coming.” Last week, CNN published that email as part of an excerpt of the new book. The piece was widely shared on social media, with many liberals saying its sentiments struck an emotional chord. On Saturday, though, Rev. Matthew Deuel contacted a CNN reporter, saying some paragraphs in Shillady’s writings appeared to be “inspired” by a blog post he wrote in March 2016. While certainly newsworthy, I became annoyed that the story became about the man. Yes, I recognize Dr. Shillady did a ton of work in editing and communicating to Secretary Clinton these devotionals, and he’s the most media-savvy contact. But there’s 115 clergywomen that contributed, and I think their contributions are much more newsworthy than Dr. Shillady’s failed footnotes and academic standards. While there was a UMC.org article and an Atlantic article before its release, there hasn’t been as much since, and certainly not focused on the clergywomen themselves. So here are their stories. I sent it after seeing Sec. Clinton’s speech at the convention and there were 71 comments…It was a collective work where young clergy women came together to do something amazing. I asked a dozen or so contributors to reflect on why they participated in the project, but I’m thankful to know it originated from clergywomen looking to support a United Methodist laywoman named Secretary Clinton. The picture above is the wall of pastors at my church. That wall is why I wrote. Being the first woman to serve in a specific way is daunting and exciting. Sometimes I feel oppressed by understanding that who I am and what I do is shaping the opinions of many not just about me but of all “women pastors,” and if Hillary Clinton felt that way at all I wanted to support her in prayer and be able to share that support with her. When we embarked on this project, we knew nothing of the publication. We just wanted to quietly support our sister, a United Methodist, in her work to shatter a ceiling. She is a woman of faith who continues to withstand bashing, pressure and malice because of her gender and how she lives out a committed life of faith. I hope that this book and Senator Clinton’s life is an inspiration to all. I have always admired the way Hillary was able to be more than who a woman was supposed to be. As a woman in ministry, I know what it feels like to be too outspoken, not soft enough, not pretty enough, not whatever enough. And for me, she was very Methodist in the way she’d always tied her faith to action. So I wanted her to know that we were with her. That there were young women who were inspired by her. And that we were holding her in prayer. It was an honor to work with my sisters in faith to offer our support in they way we knew best. This is a woman that I’ve looked up to my whole life and I got to offer her something from my heart and that means everything. I wrote a devotion because as I watched Clinton embody grace under fire during that year, I hoped our words would encourage and inspire her to remember her grounding in the stories of Scripture, and specifically those of Shiphrah and Puah resisting Pharaoh’s death-dealing policies in Exodus… that it is always difficult but necessary to fight with integrity against the powers of darkness, and that women in leadership have a unique calling in that work. I wrote devotionals because, in my opinion, one of the jobs of a pastor is to see people as people (not positions), to pray for them, and, when given the opportunity, to lead them ever closer to God. Additionally, I and many of my colleagues recognized a lot of the hurtful, sexist rhetoric being thrown at Secretary Clinton that we hear at times in our own leadership roles (comments about our clothing, our leadership styles, etc. being gendered reflections of our ability to lead). By being a part of this project, I hoped that both Secretary Clinton and others recognized that they are not alone. I accepted the invitation to write a devotion because it was a chance to pray with and for one of the leaders of our country. Politics aside, Hillary is a fellow United Methodist and I know of how faith is an important part of her story. But, I was not committed to pray only for this candidate. When Trump won the election, I invited my congregation to write prayers and we collected them and sent them to his transition offices at Trump Tower. As people of faith, lifting up those in power, challenging them to live out the faith they claim, holding them accountable, and sharing God’s vision of the kingdom are all ways we can follow Jesus. “I’m from Arlington, Virginia, a suburb of Washington, D.C. My home church has a member who once served as a senator, and I have local colleagues with worshippers who arrive with Secret Service security details. This makes me very aware that public officials are real people with spiritual needs and struggles. I love serving in a denomination where both Hillary Clinton and George W. Bush find a spiritual home. 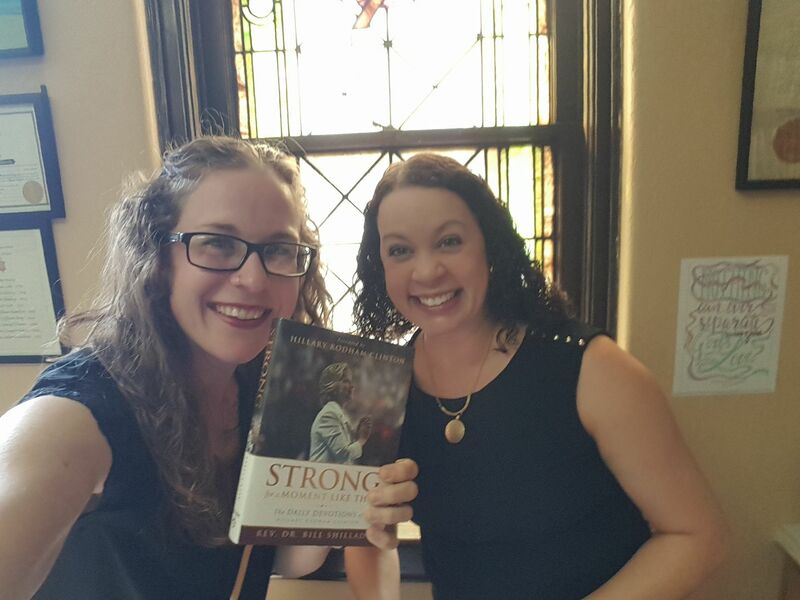 Being in the public eye can take a deep emotional and spiritual toll on a person’s health, and I was honored to be able to write a devotional with the hopes of helping Secretary Clinton find courage and strength through the wisdom of the Word. Strong female leaders face incredible level of scrutiny, and must create their own infrastructure of support. I was drawn to the image of Deborah, who served as Judge, the highest public office in her time. I saw a connection to the leadership of Deborah, and to the way that she had to be supported by other women as well in order to secure victory for her people. My hope is that through these devotionals Secretary Clinton could feel the support of other women who were praying for her. I close with three ones that hit me right in the heart as they reflected on what their words meant for after the lost election. I joined the #WePraywithHer editorial team because I wanted to help ground a candidate in her faith. I am tired of politicians talking about their faith but rarely living it, so I decided to be part of a group of people praying for a candidate and hopefully challenging her as well. I never really thought it would be so transformative for me. As an editor, getting to read the devotions daily ended up being a spiritual practice for me, and I found hope in the words of my colleagues, especially after the election. I had my second miscarriage exactly a week after the election, and so the words of hope and persistence meant to remind Hillary Rodham Clinton what a difference her campaign made despite the loss also reminded me not to give up. I wanted to support someone who has lived out my own faith ethos of public service. I also was thrilled to be able to support the first female major party candidate for president. Secretary Clinton received my contribution just after the election and I hope my words helped her through a time of great disappointment and turmoil. Maybe now they will also help others who are facing daunting challenges. I am incredibly thankful for the opportunity to share faith in this way and to be included in this work with several of my clergy sisters. I wrote a few devotionals for this project, and the one that was published was written when the project coordinators were seeking a few last devotionals to round out the end of the year. I wanted to write something about the new life/hope for resurrection that I think many of us were(are) feeling as a nation. I thought Hillary Clinton faced so much that was unfair in the election campaign, and I could imagine the pain and bafflement of feeling “They would have Donald Trump rather than me.” I hoped to speak to what might come after that pain. Photo copyright Sarah Harrison-McQueen. Used with Permission. In all, 115 clergywomen contributed devotions. I’m longtime Facebook friends with 14 clergywomen whose stories were included, and 9 additional clergywomen who wrote devotions that Secr. Clinton saw but were not included in the final compilation. I was annoyed that they were not getting talked about or written about, so I hope you enjoyed a sampling of stories of those who contributed. You can buy the book on Amazon here. Thanks for reading, commenting, and your shares on social media. And as always, your support of women’s voices in the media and in the pulpit–and in public service. If you want a copy better hurry. It is being pulled for extensive plagiarism. Wouldn’t it be ironic if plagiarized material came from a Mark Driscoll book! Just a note that the “extensive plagiarism: referenced in another comment included several additional female clergy and at least one gender-non-conforming clergy. I think it’s miserable for these 115 clergywomen who contributed original material. I think it’s worse for the clergy who were plagiarized. If Church is a Play, what Act are you in?